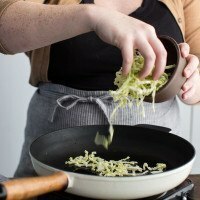 Pea Potstickers with Cabbage and Ginger | Naturally. When I was writing the Easy Vegetarian Kitchen, it took me a bit to solidify the 50 base recipes because there were so many choices. 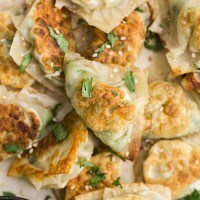 I tried to keep things easy (since it’s in the title), but one of the recipes I knew I wanted to include: potstickers. They look hard but it’s all about the pleating and once you do it a few times, it becomes muscle memory. 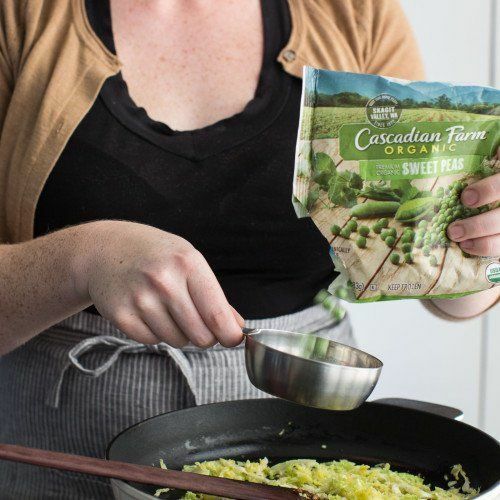 These pea potstickers are a favorite of mine because I almost always have a bag of frozen peas in the freezer (just as healthy, easy to use, and baby friendly!) 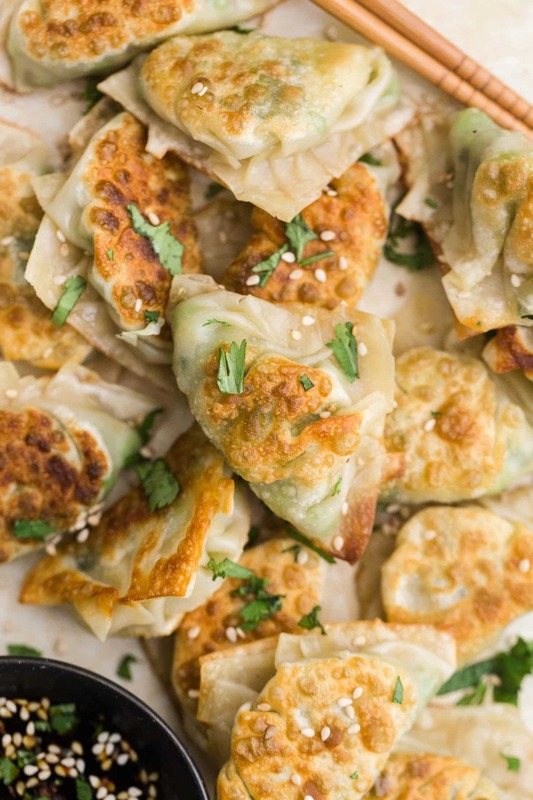 These potstickers are great for dinner or a great movie snack. Preheat a large skillet over medium-low heat. Add in the cabbage and cook for 2 minutes, just to soften. 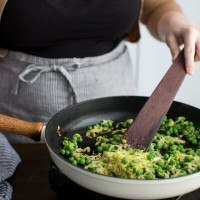 Stir in the ginger, garlic, and peas. Continue to cook, stirring occasionally, until the peas are warm and starting to char. Remove from heat and stir in the cilantro. Whisk together ingredients for the sauce and serve along side the potstickers. + If you have extra time, I recommend doubling/tripling the batch and freeze the extra. To freeze, after pleating, place on a tray so that no potsticker is touching another and freeze. Once frozen you may then transfer to a container. When ready to eat, you can cook them frozen- just allow for a little extra time. 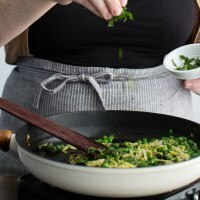 Before diving into the variations, I want to say a bit about the cooking method. For the longest time, I’d fry the bottom of the potsticker then add water, cover, and steam. This is perfectly acceptable but I’ve found over time that I love the crunch of the fried-only. If you’re looking to use less oil, try the steaming method (can be found here). Cabbage: Don’t want to buy a big head of cabbage just to use 1 cup of it? Spinach, kale, bok choy, or chard works well in place of the cabbage. Spiciness: I sometimes like to up the heat of these pea potstickers by adding a pinch of chili flakes or sambal oelek to the pea filling. Yumm, these sound delicious! I had never heard of pot stickers before, but it looks nice. I love the variations you added! THE BEST, lovely sounding recipe too. This looks so good, I’m seriously considering making them tonight! You could do parsley or ditch it, I love the ginger flavor alone! Potstickers are a family favorite! I loved the ones that are filled with shrimp and onions! 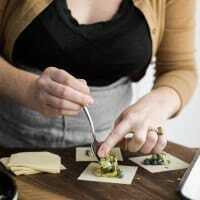 Such a clever idea, I love peas AND potstickers! 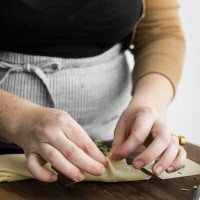 Great potstickers recipe (and tutorial for making them)! I need to make these! I’ve never attempted but you make it look so easy!! This looks delicious. I will be making these when I get back from my vacation. I love the step by step instructions. Yum. I seriously LOVE when you make videos! They’re so relaxing to watch and this shows people that potstickers are not difficult. 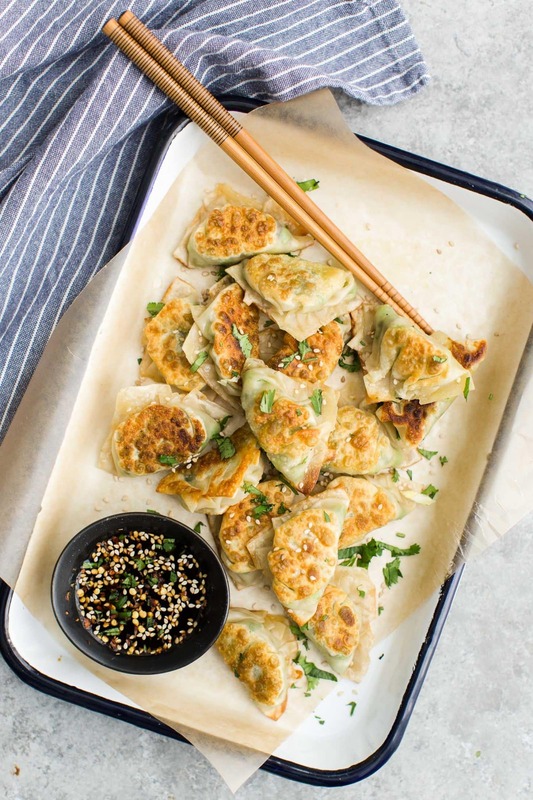 You got me hooked with your sweet potato potstickers and now I stuff just about any veggie on hand in to wontons. This recipe was amazing and actually turned out looking exactly like the pictures. (I love when that happens!) It took a little longer to cook because I doubled it, but it was enough to eat as a dinner for two and have some leftover. The sauce was lacking, so I added orange zest, Sriracha chili garlic paste and honey, which was yummy.